There are two major issues that we have been facing in our house lately. 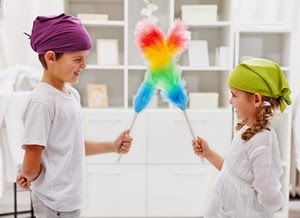 One of them is the children fulfilling their responsibilities when it comes to the maintenance of our home environment. Because the three of them make the majority of the messes, eat the majority of the food, and cause the majority of the destruction; I feel that it is only fair that they have obligations to fill when it comes to keeping our house clean. They all have their own jobs around the house. My eldest daughter does the dishes, and she folds the laundry, and cleans the kitchen counters for example. We have been running into a problem where the kids put off their duties early in the day, and then when an opportunity comes up for them to go out and play when I am busy at my desk, they often take off with their jobs left undone. This does not make mom very happy. The other challenge that we are having is with kindness. My children are absolutely excellent when it comes to how they interact with other kids, but when it comes to their tiny trinity…they often fight like cats and dogs. They say mean things when they get upset and it bothers me a lot, because it is not a representation of who they are. They are good kind kids, but when they lose their composure and get angry with one another, they seem to forget who they are completely. It was becoming a problem. So we decided that they have to meet two goals each day to earn their time for television or videogames. The first is completing all of their household duties, before they go anywhere, and without being asked. The second is that they must be kind at all times. If I hear anyone say anything rude to anyone else during the day they lose one hour of media. We set a time of six o’clock each day before they can spend their hours on either activity. After almost a week now, the plan has definitely been successful; especially so with the kindness part. It is remarkable how after just a couple of days of getting called out on saying something mean to one of their siblings and losing that hour of media time, the behavior has rapidly diminished. I am not saying that they are going to stop bickering with each other completely…that would be…well sort of utopic and extremely unrealistic to expect, but the improvement that we are seeing is awesome. The responsibility part is still weighing on my shoulders more than I would like, but I am keeping in mind that it is going to take some time for the kids to take on their tasks by their own initiative. All in all though, this approach is working pretty well…the more that we experiment and communicate with one another; the better parenting solutions we discover, each and every day.